Dives happen. FIFA knows it. They count on the one poor ref to make a critical call (with the help of side judges and their sometimes ignored flag up(!)). I said flag up!!! Okay, forget it. It's a lot to ask one ref covering such a large field of play to catch everything 22 players might be doing. American's popping up once every four years to care about soccer get pissed off. It's such a strange thing to see players diving to get a foul. We see it in HD, why can't the refs see it? Answer is; just one guy. It's more on FIFA to make changes. The iron grip of FIFA. Truth is for FIFA is that this stuff IS in high definition now with the capability of every angle possible and Americans are watching. Americans want puritan fair play. If something hurts... it hurts. If it doesn't, get up and get going. Yeah, there is gamesmanship in basketball (charges), some in football (everything at the line of scrimmage and off the ball), even baseball (corked bats, um... steroids). But, it is frowned upon. Americans want fair play. Replays, umpire discussions, bball refs watching a screen courtside. Some other countries don't have this feeling. They will take advantage if it can be gotten away with. My father once told me a story of when I was a boy about an engine building technical competition in Japan. On the first day the Americans and Germans were in front. Japan... a distant last. The next few days saw the Americans and Germans doing well. All the sudden towards the end of the competition Japan took the first spot after being in last the whole week. My father asked them how that happened. Their answer? They filmed the other teams with cameras in the ceiling and studied it all week. My father never said whether he penalized them, but it wasn't about that. It was more about the Japan's feelings towards fairness. The didn't feel it was unfair to film then copy and do better. The feeling was "Why not?, the point is to win". Italy has names for the way the play the game with all the flopping around. It has served them well, I suppose. Teams like Brazil and Portugal also seem to do it. It's not seen as cheating. It's gamesmanship. To me. It's awful and embarrassing. While I do not see other countries changing the way they play - even if it looks ridiculous in HD or played a million times on youtube. It is the way it is until FIFA changes how many refs they have on the field. I'm not an advocate for instant replay. I despise it in any sport. But I am an advocate for soccer to put refs on the goal lines and allow discussions between the officiating group. That said, they would have to be able to communicate well. And that would require a common language to be spoken between officials. Anyway, it is a tall task for the FIFA organization, which has a tall task anyway of bringing together the entire world to play a tournament. So, I'll cut them some slack for that fact. 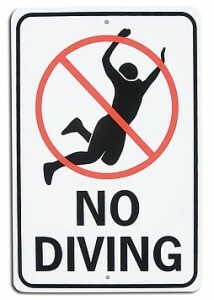 Anywho, I do think diving will slow down as time progresses on. Constant replays in glorious HD will clear some of that up. I can only imagine how bad it was 30-40 years ago for a puritan team to play a Brazil squad. Is this why Brazil has won so many? The more important question that could become in the next WC. What happens when you take away that Italian dive against New Zealand? "What happens when you take away that Italian dive against New Zealand?" Italy would have burned to the ground. In the 66th minute, barring a miracle, Italy IS about to burn to the ground.